He then chanted ‘Bharat mata ki jai’ a number of times. Same day Waris Pathan, MLA, was suspended from the Maharashtra Assembly for refusing to chant ‘Bharat mata ki jai’. He apparently did not have the right to not chant it. The loutish duo of Salim-Javed was primarily responsible for constructing the undemocratic ‘angry young man’ avenger figure and the subsequent rise of proto-Fascist cinema in India in the 1970s and the 80s. For the twosome, who still remain unrepentant, there could be no forgiveness. This screenplay and dialogue writing team cynically exploited the political disillusionment and mass social discontent to create a popular demand for authoritarian and extra-constitutional solutions for the problems of the day. Taking the law into one’s own hands and wreaking vengeance were the main characteristics of their hero figures. Theirs was a cinema tailored to fit the needs of Sanjay Gandhi’s brand of politics. It took more than one and a half decade for their stranglehold over the Hindi film to loosen. In the meantime the team broke up. Javed, clearly cleverer of the two, carried on along the same line for some time, looking for an opportunity for a make-over. 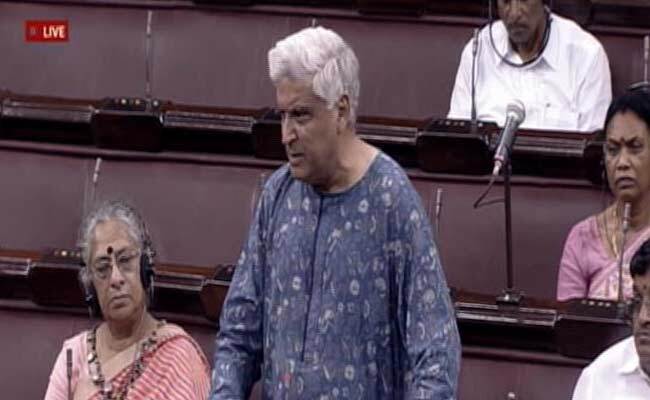 The made-up secular icon, litfest fixture, re-formed messenger of peace and amity, and an all-purpose son of India we know today as Javed Akhtar belongs to this late period. Asad Zaidi is a Hindi poet. He runs Three Essays Collective, an independent publishing house. Hyderabad: Police on Wednesday booked MIM leaders Asaduddin Owaisi and his brother Akbaruddin Owaisi and arrested three activists of the party for attacks on their political rivals during elections to the Greater Hyderabad Municipal Corporation (GHMC) on Tuesday. Hyderabad police have booked Majlis-e-Ittehadul Muslimeen (MIM) chief and Hyderabad Lok Sabha member Asaduddin Owaisi and his brother and party leader Akbaruddin Owaisi in three different incidents of attacks on political rivals. 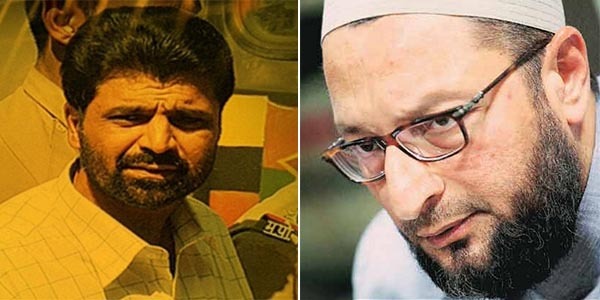 The Owaisi brothers and others were booked for unlawful assembly, voluntarily causing hurt, wrongful restraint, criminal intimidation and other charges. Police said three people were arrested based on the video footage of the incident that occurred near Mirchowk police station in the old city wherein the Congress party’s Telangana unit president Uttam Kumar Reddy and senior leader and legislator Mohammed Ali Shabbir were attacked. 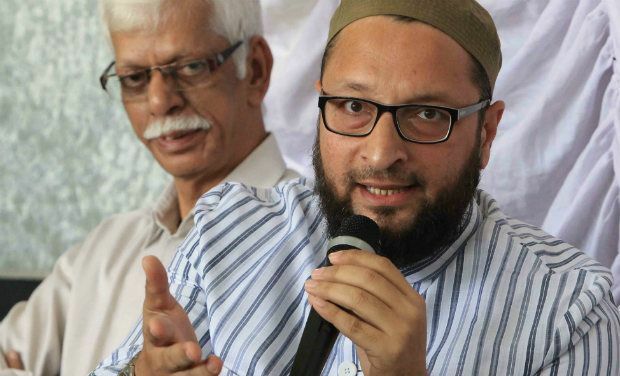 Asaduddin Owaisi with his followers had come to the police station, taking objection to the presence of the Congress leaders, who were there to seek release of their party activist Mohammed Ghouse. Deputy Commissioner of Police V. Satyanarayana said they were questioning the accused, who will be produced before a court on Thursday. 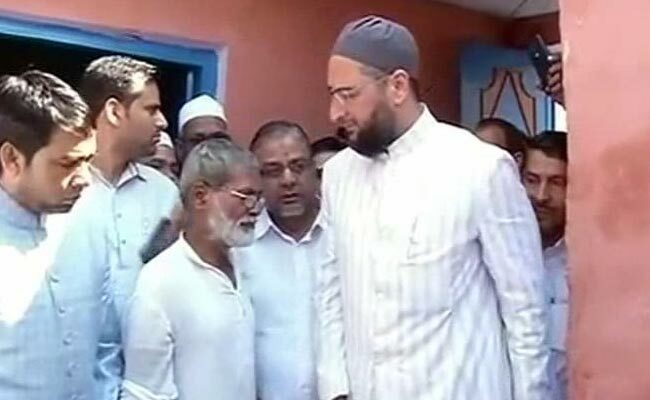 He said Asaduddin Owaisi was an accused in the case, which has been registered on a complaint by Congress leaders. Police took action after analysing the evidence and screening the video footage. The DCP said two teams were working to conduct the investigation and gather evidence. Police also booked Akbaruddin Owaisi, MIM leader in the Telangana assembly, for the alleged attack on a candidate of the Bharatiya Janata Party (BJP) in Jangammet division, also in the old city. The police officer said an investigation was taken up after BJP candidate Mahender lodged a complaint against the MLA at Chandrayangutta police station. Another case was booked against Asaduddin Owaisi on a complaint by Mubashiruddin Khurram, a reporter of Urdu daily Siasat, who was injured in an attack by MIM workers. Meanwhile, another MIM legislator Ahmed Balala, who was arrested on Tuesday for the attack on the son of Telangana Deputy Chief Minister Mahmood Ali, was released on bail by a city court. A separate case against Balala was booked on a complaint by Majlis Bachao Tehreek (MBT) leader Amjadullah Khan Khalid, who was also injured in an attack. In another incident in Langar Houz, MIM workers allegedly attacked their rivals belonging to the TDP and the BJP. Director General of Police Anurag Sharma and Hyderabad Commissioner of Police Mahender Reddy reviewed the cases booked against MIM leaders in connection with various incidents of violence. The opposition parties have demanded immediate action against MIM leaders for the attacks. Leaders of Congress, Telugu Desam Party (TDP) and BJP held a meeting to condemn the attacks and seek immediate action. The delegation led by Leader of Opposition Jana Reddy also met Governor E.S.L. Narasimhan to demand strong action against MIM leaders. They said since the governor has law and order powers in the joint capital of Hyderabad under section 8 of the Andhra Pradesh Reorganisation Act, he should invoke the same to intervene in the matter as the TRS government is not taking any action. The Congress party also wrote to Election Commission of India, urging it to derecognise MIM and disqualify Owaisi brothers from contesting elections. 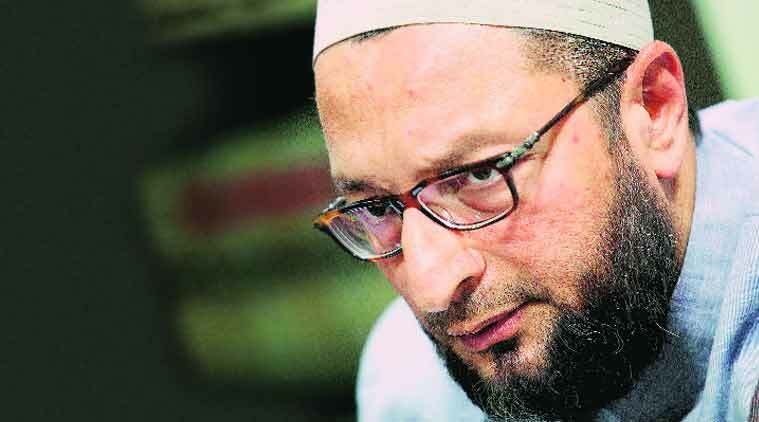 Hyderabad: A ban on consumption and sale of beef may be imposed in the city if AIMIM was not voted to power in the upcoming elections to Greater Hyderabad Municipal Corporation (GHMC), party chief Asaduddin Owaisi claimed on Monday. “I am not trying to scare you. But, the fact is if we don’t come to power, there may be a scope for ban on beef (in Hyderabad) on pretext of faith,” the All-India Majlis-e- Ittehadul Muslimeen (AIMIM) leader said in Hyderabad. Addressing a public meeting ahead of the February 2 election to the 150-member civic body, the Lok Sabha lawmaker from Hyderabad said such a ban will hit the poor and also beef traders hard as it happened in Maharashtra. “There is a ban on cow slaughter all over. In Maharashtra, the BJP-led Government brought a law to extend the ban on bulls and bullocks. 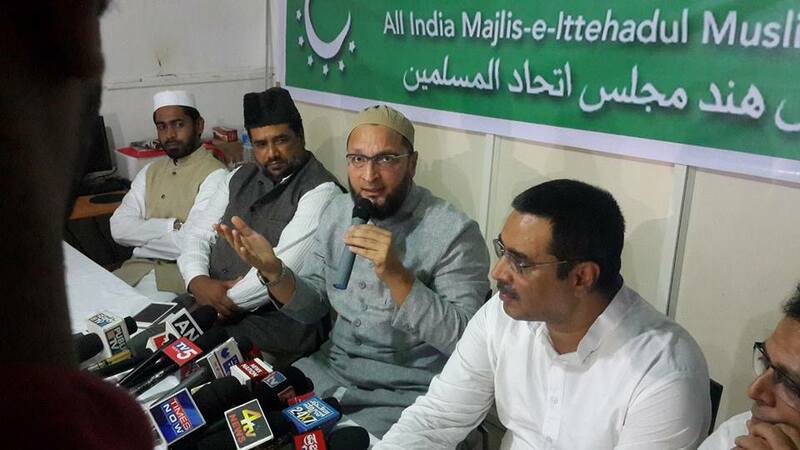 Even if it (these animals) is ill you cannot slaughter it,” Owaisi said. It is the poor who cannot afford to eat mutton and they have to depend on beef, the MP added. AIMIM, a Hyderabad-based party, and Congress shared power in the municipal corporation in the last term. Kishanganj: An FIR was today lodged against All India Majlis-e-Ittehad-ul Muslimeen (AIMIM) legislator Akbaruddin Owaisi by Kishanganj district administration for allegedly making inflammatory speech at an election rally here yesterday. The police are also probing whether damage to idols at two temples in the town, which were discovered this morning, was a fallout of the speech, Superintendent of Police Rajiv Ranjan said. Owaisi’s speech, he said, violated provisions of section 144 of Crpc and an FIR has been lodged under sections 153A and 188 of IPC at Kochadhaman police station. The FIR has been lodged on the basis of magistrate’s report, the SP said. Owaisi had yesterday addressed an election meeting at Sontha haat village under Kochadhaman assembly constituency in Kishanganj district from where AIMIM state unit chief Akhtarul Iman is contesting. The police are probing if the damage to idols of goddess Kali in two temples in Nepalgarh locality had any connection to the speech. The SP said idols were found damaged in two adjacent temples this morning and created tension in the town and protests. District administration sought to maintain peace by talking to people of the two communities, he added. Owaisi hit out at Prime Minister Narendra Modi over his “silence” on the issue, saying he should have at least sent his condolences in a tweet if “he believes in pluralism and upholding of law”. New Delhi: A political war of words erupted on Thursday over the execution of 1993 Mumbai blast convict Yakub Memon, with a section of opposition leaders speaking against the death sentence. Congress general secretary Digvijaya Singh fired the first salvo, saying that the BJP- led government should show “similar commitment” in all cases of terror as it showed in the case of Yakub Memon. “I hope similar commitment of the government and the judiciary would be shown in all cases of terror, irrespective of their caste, creed and religion,” he said in a tweet following Memon’s execution in the Nagpur central jail on Thursday morning. Party colleague and former union minister Shashi Tharoor said he was “saddened” by Memon’s execution. “Saddened by news that our government has hanged a human being. State-sponsored killing diminishes us all by reducing us to murderers too,” Tharoor tweeted. “There is no evidence that death penalty serves as a deterrent, to the contrary in fact. All it does is exact retribution, unworthy of a government,” the Thiruvananthapuram parliamentarian said. “I’m not commenting on the merits of a specific case; that’s for the Supreme Court to decide. Problem is death penalty in principle and practice,” he added. Communist Party of India (CPI) leader D Raja, meanwhile, said that the death penalty should be done away with in the country. “India should say an emphatic no to capital punishment…. It does not mean we do not have sympathy with those (blast victims’) families, but by snatching away one life will not bring back all those lives,” Raja said. All India Majlis-e-Ittehadul Muslimeen leader and Hyderabad parliamentarian Asaduddin Owaisi said the government should ensure death sentence in all similar cases. “Death sentence should also be given to Babu Bajrangi, Maya Kodnani, Col. Purohit and Swami Aseemanand,” he said. While Babu Bajrangi and Maya Kodnani are accused in the Gujarat riots, Col. Purohit and Swami Aseemanand are accused in the Malegaon blast. The ruling BJP slammed the leaders opposed to the hanging. Tharoor and Digvijaya Singh were forsaken by the Congress as well, which said it was their “personal views”. Congress spokesperson Randeep Surjewala said the views were that of the leaders concerned and not of the Congress. Former home secretary and BJP parliamentarian R K Singh said those making such comments did not have national interests on their minds. “These people don’t think about national interest. Whether he (Yakub) had to be hanged or not was not to be decided by the government but the court, and the president uses his judgment after that…,” he said. Minister of state for parliamentary affairs, Mukhtar Abbas Naqvi, said justice had been done. “Justice has been done; this increased the people’s faith in the judicial process. He got two decades to prove his innocence, and he was proven guilty,” he said. Yakub Abdul Razzak Memon, convicted in the March 12, 1993 Mumbai serial blasts, was hanged at Maharashtra’s Nagpur central jail on Thursday morning.